Create the invitation and program for “Coming Together for Children Alone”, a fundraiser to support KIND. KIND was founded by Angelina Jolie and the Microsoft Corporation to create a pro bono movement of law firms, corporations, nongovernmental organizations, universities and volunteers to provide quality and compassionate legal counsel to unaccompanied refugee and immigrant children in the United States. KIND serves as the leading organization for the protection of unaccompanied children who enter the US immigration system alone and strives to ensure that no such child appears in immigration court without representation. We achieve fundamental fairness through high-quality legal representation and by advancing the child’s best interests, safety, and well-being. 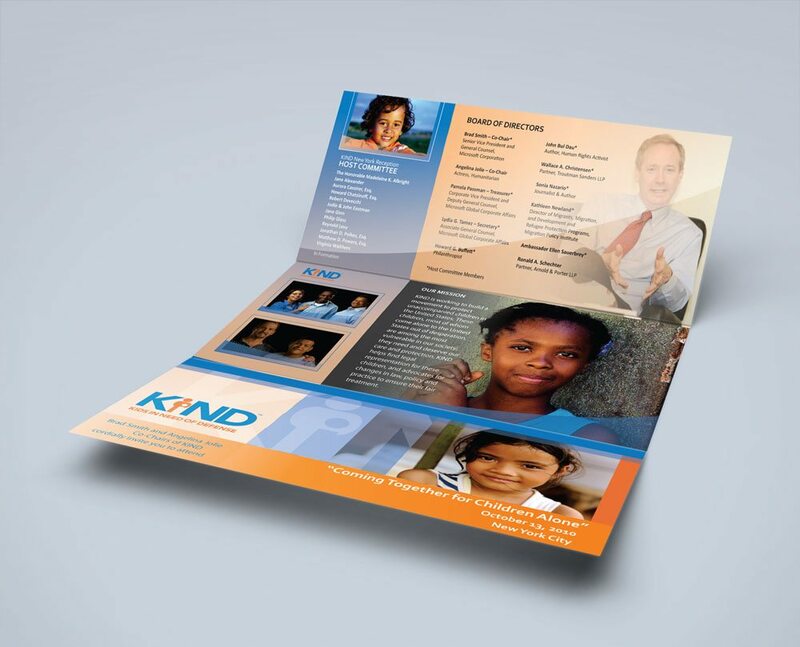 KIND is located in Washington, DC.